The viscosity exhibited by shear-thinning fluids within the interstices of a porous medium differs depending on pore dimensions and injection velocity. Therefore, predicting the macroscopic value of viscosity required as input to Darcy’s law is challenging and needs accurate identification of the characteristic microscopic dimensions dominating global pressure losses. The most common approach consists of defining an apparent “in situ” shear rate which can be used in the bulk constitutive equation of the fluid to predict viscosity during flow through the porous medium. The dependence of this apparent shear rate on Darcy velocity has traditionally been assumed to be linear, which is appropriate in the case of Newtonian fluids and power-law fluids. However, yield stress and plateau viscosities that can potentially affect such dependence are not captured by power-law model, so the linear assumption may lead to inaccurate viscosity predictions. For this reason, a set of two-dimensional (2D) flow problems were considered and solved numerically to assess the effects of the shear rheology model, the pore size distribution and the microstructural complexity on the value of the apparent shear rate. 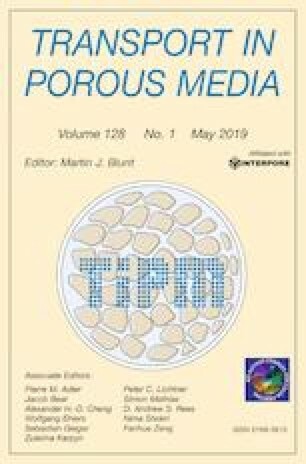 In order to facilitate the analysis, the microscopic features of all the investigated porous media were well characterized through pore network modelling. The present results prove the inability of traditional approaches to predict the macroscopic viscous pressure losses generated during the creeping flow of widely used Herschel–Bulkley and Carreau fluids. In particular, the existence of a yield stress or a plateau viscosity induces significant deviations from linearity in the relationship between apparent shear rate and Darcy velocity. The importance of these deviations is, in turn, shown to be highly affected by the dispersion of the pore size distribution and the degree of shear thinning. Moreover, the reasons for such observations are discussed using an analytical approach.